Idaho Chicken Ranch: Happy Two! This month marks two years at the Chicken Ranch! So many fun times! And a lot of hard work too. It's easy to beat ourselves up because it seems like our house is always in complete and utter construction chaos, and as I've mentioned approximately one million times, everything is usually covered in a thin coat of dust. But such is life in the remodel of a 1939 Tudor. In the past two years we have replaced the furnace, installed an A/C unit, updated the duct work throughout the house, installed all new gutters where there were few before, removed the walls and ceiling in the basement, installed a plumbing manifold system and the bulk of the plumbing for the downstairs (new) bathroom, did a complete remodel of the main floor bathroom including retiling the tub, installed new lighting fixtures on the main floor, replaced the walls in the hall, removed the tile on the main floor and sanded the hard woods, and replaced the windows and doors. I think that's about it. 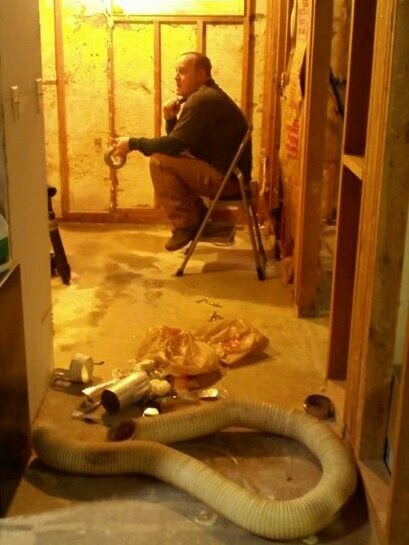 As such, this pensive pic of my husband in the basement always makes me grin. He seems to be saying, "What have we got ourselves into..." :) Happy two years to the Chicken Ranch! And thank you for coming along for the ride! !